I will never forget the day Dylan came home from school and said, with bright eyes and a big smile, "Mom, just listen first, ok?" Oh, this can't be good. I knew this was going to be something I would have to say yes to, but I must admit what he was about to ask me made me cringe a little. This past year, the third grade classes started vermicomposting (worms, for those of you who don't know) in the school garden. I can't tell you how many times he came home and told me about these little red wigglers that had become his "friends" - and guess what - They need a home for the summer. Now we have talked about starting our own worm bin, but mind you talk is all we have done. I don't have a yard - we live in an apartment. Where would these red wigglers go? Would I have to touch them? Would they get out of the bin? Oh my, the thought of little worms crawling all over me flashed before my eyes. Well, last week I became the proud owner of a black bin filled with red wigglers. OK, I can do this - it's just for the summer. The bin sat in my living room for about an hour while I prepared an area on the balcony that would be in full shade because the worms can't be in direct sunlight. Dylan gave me the crash course in how much to feed them (we were also given a scale to weigh the food), when to water t-shirts that cover them (yes, they came with their own spray bottle), and what not to feed them. Citrus fruit is a big no-no, they don't like too much acid. Oh, and apparently their favorite food is egg shells, coffee grinds and melon rind, so I have a baggie of melon rind in my fridge. 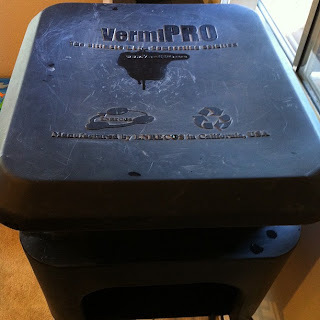 Do you compost? Is it something you would consider doing? I hear worm poop is the liquid gold of fertilizer. Everything has its place in the ecosystem ... even worms! Oh no, luckily this one doesn't have to be spun. I just have to fed them and the rest is up to Dylan! We Pinned It For Tigers - and we Won!